The Anti-Gravity mod comes to us from Japan and allows you to control gravity, make your own planets and stars and perform acrobatics like wall jumping and wall running. 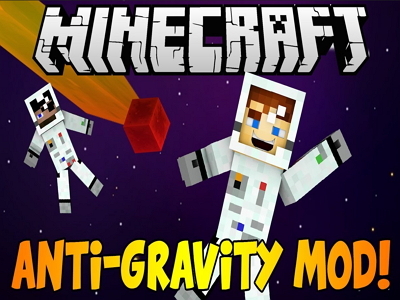 The Anti Gravity mod for Minecraft also adds several essential items to help change the gravity at will and even get shot out of a cannon. Then cover the inner cores with outer cores. This is a miniature planet that you can walk around on. You will need a Gravity Controller and a Star Controller, both are important in case the gravity gets out of control. The Gravity Controller affects gravity itself while the Star Controller affects Gravity Cores. Gravity Walls allow you to stick to walls. By sticking Gravity Walls on multiple surfaces, you can wall run or wall jump through an area and even stick to ceilings. The ManBazooka shoots you out of a cannon straight into the air while riding a squid. Try combining this with some of the other items in this mod!